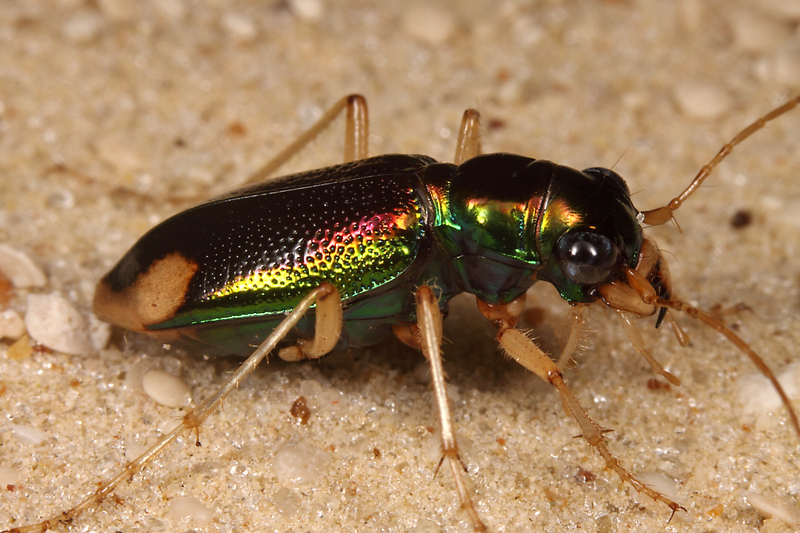 I fear my recent series of posts from Florida might leave readers with the impression that all of that state’s tiger beetle species are rare endemics occurring in tiny remnants of relictual habitats and encountered only by the most intrepid collectors enduring the harshest of conditions. While it’s true that Florida has its share of such species (perhaps more than any other state in the country), it is also home to numerous species that most cicindelophiles would consider rather common—even pedestrian. “Common” is a relative term, however, depending on where you live, and featured here is a species that until recently would have been for me just as exciting a find as Cicindelidia scabra or Habroscelimorpha striga. Tetracha carolina (Carolina Metallic Tiger Beetle) is one of the most widely distributed tiger beetle species in the Western Hemisphere, occurring not only across the southern U.S. but also the West Indies and south through Mexico, Central America, and the west coast of South America to Chile. It was only during the past 10 years, however, that I actually saw the species for myself in Missouri, as it is restricted to the Mississippi Alluvial Plain in the extreme southeastern corner of the state (the so-called “Bootheel”). Not much was known about the status of this species in Missouri the first time I encountered it under building lights at the University of Missouri Delta Research Center in Portageville. It was my first experience with “nocturnal tiger beetling,” and you can imagine my excitement at seeing these green and purple beauties glittering in the light of my headlamp. We now know that the species, despite its restricted occurrence in Missouri, is actually quite common in a variety of habitats in that part of the state, including even agricultural fields where they hide during the day under irrigation pipes (Fothergill et al. 2011). 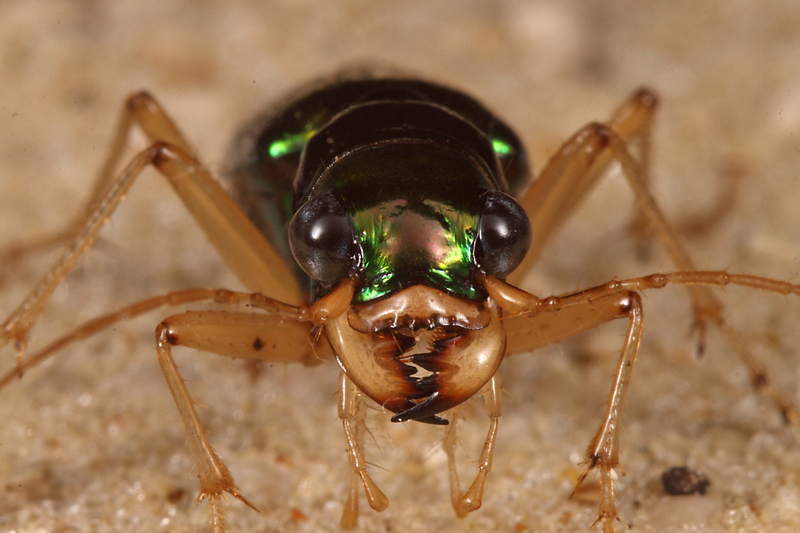 I simply can't resist these tiger beetle face shots! The individual in the photographs shown here was seen at the famed “Road to Nowhere” site in a remote part of the Florida Gulf Coast—one of eight total species of tiger beetles that I’ve seen at this site during my two August visits (2009 and this year). This site is actually one of a few places in Florida where this species co-occurs with T. floridana (Florida Metallic Tiger Beetle), an endemic species restricted to estuarian habitats in the southern half of the Florida peninsula, and until recently considered a subspecies of T. carolina (Naviaux 2007). The brilliant purple reflections in the basal half of the elytra clearly distinguish this individual as T. carolina, as did its occurrence up on the drier sandy roadside rather than down in the salty mud flats preferred by T. floridana. Also seen at this site up along the road were numerous adults of the broadly distributed T. virginica (Virginia Metallic Tiger Beetle), making this one of the few sites in the country where three of the four U.S. species of Tetracha can be found (the fourth, T. impressa—Upland Metallic Tiger Beetle, is a Neotropical species that reaches the U.S. only in the Lower Rio Grande Valley of south Texas). Fothergill, K., C. B. Cross, K. V. Tindall, T. C. MacRae and C. R. Brown. 2011. Tetracha carolina L. (Coleoptera: Carabidae: Cicindelitae) associated with polypipe irrigation systems in southeastern Missouri agricultural lands. Cicindela 43(3): in press. 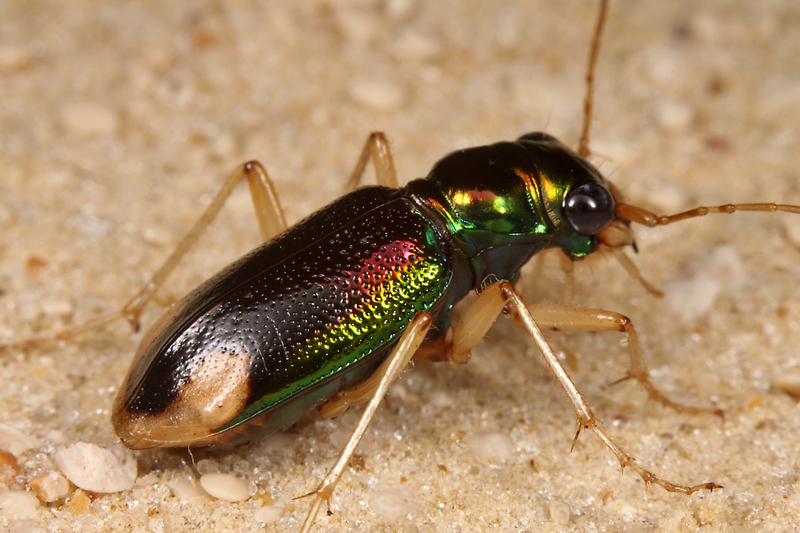 This entry was posted in Cicindelidae, Coleoptera and tagged beetles, entomology, Florida, insects, nature, science, tiger beetles. Bookmark the permalink. These come around my back porch at night and I live in lower alabama! Exciting to know what they are.! Since they are predators of other insects, they are probably attracted to the insects that are attracted to your porch light. They are a treat to see. I live in Metro Atlanta and just found the 3rd one in my house in the last few months… can’t say I’m thrilled but they are pretty cool! At least I finally found out what they are. This species does occur in your area, but it’s interesting that you’re finding them in your house. They are not attracted to lights and really don’t even like to fly. Perhaps it is another type of insect that looks like this one? If you can take a photo next time you see one and send it to me I’ll let you know if it’s the same thing.